Few cars are collectible from the moment they are born. But when the 2018 Dodge SRT Demon came off the assembly line in January there has been such a clamor for this retro classic Mopar that it looks like it is already collectible right from the gitgo. 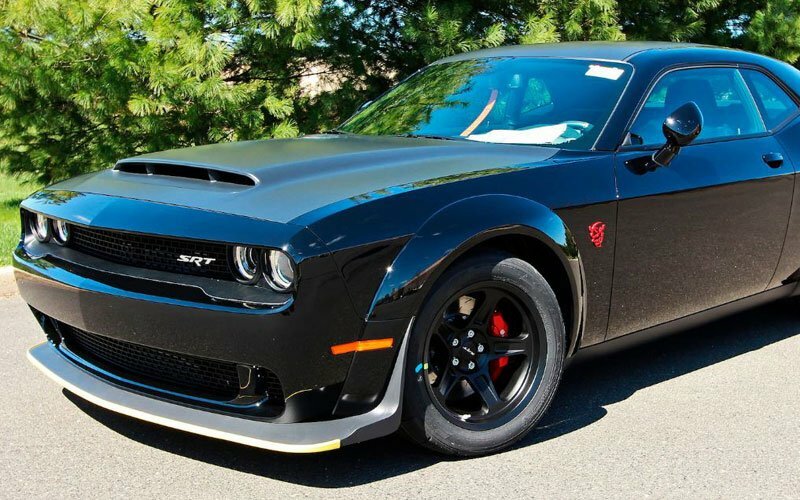 The first one to cross the auction block at Mecum last week was a black 2018 Dodge SRT Demon with just five miles on it. It stood there “still in the wrapper” with all the plastic wrap just like it is delivered to a dealership from the factory. 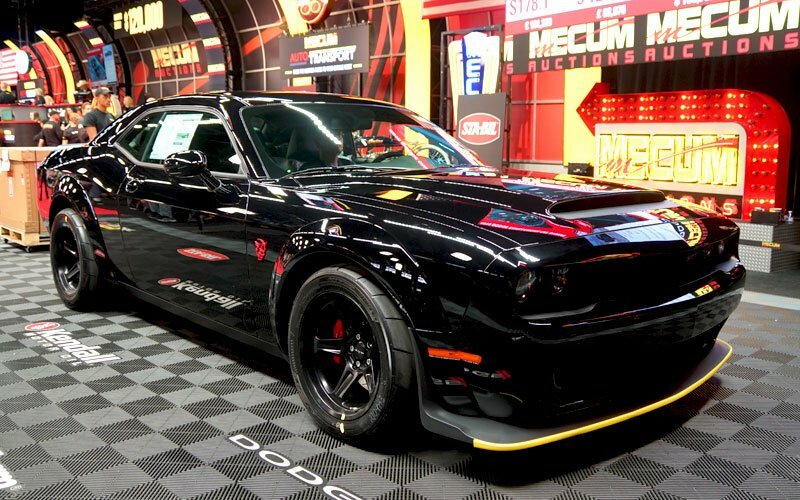 (Follow this link to the Mecum promo informationn on Lot # T108.) It hasd no passenger seat, no back seat and no carpet in the trunk. All the race ready stuff was still in the crate. The factory race car sold for $126,500. Although the sticker price on a 2018 Dodge SRT Demon is $89,062, some dealers are selling the right to order the car apart from the price. (The reason for this is that Dodge is only allocating deliveries to dealers who keep the sale price below the MSRP.) Other dealers are only selling Demons to their priority customers. Dodge is still building the 3,000 initial production run of Demons and deliveries are still being scheduled. It is anticipated that there will be far more people who want to buy a 2018 Dodge SRT Demon than there are cars to sell. So the three cars being offered here in Indianapolis at the Mecum Auction were premium offerings. A black 2018 Dodge SRT Demon with the black interior sold for $143,000. 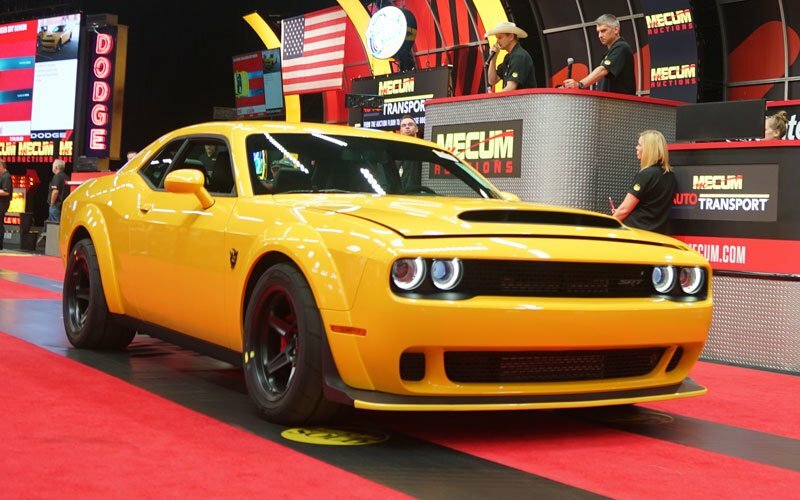 (See the Mecum promo info for Lot # S178.1.) It too was without dealer prep and offered still “in the wrapper” from the factory. They say it had only five miles on the odometer. This one came with the Demon Crate Package – all the racing stuff. 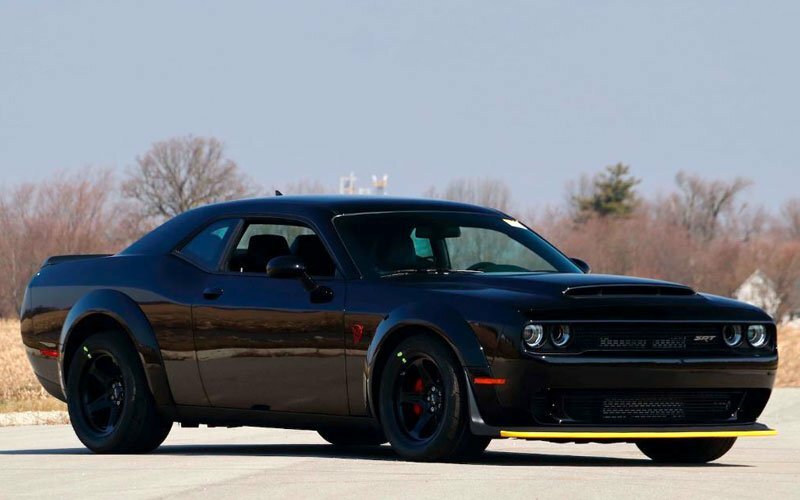 With the Demon Crate Package you can increase the horsepower from the base 808 to 840 hp. 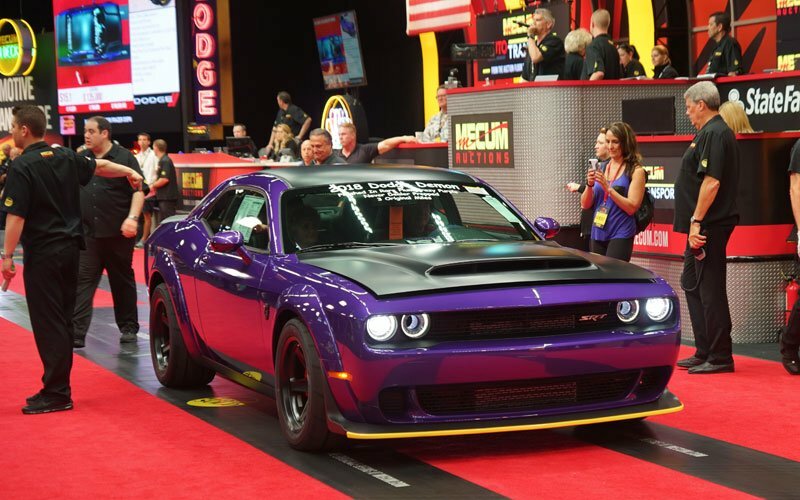 The Mecum promo said it also came with a special Demon Press Kit which was only available to those in attendance at the original Demon unveiling ceremony in New York City. Collectors will want to know that the Demon Press Kit will become a pricey collectible of its own. The car uses functional air-catcher headlamps and the Demon-exclusive enlarged hood scoop. 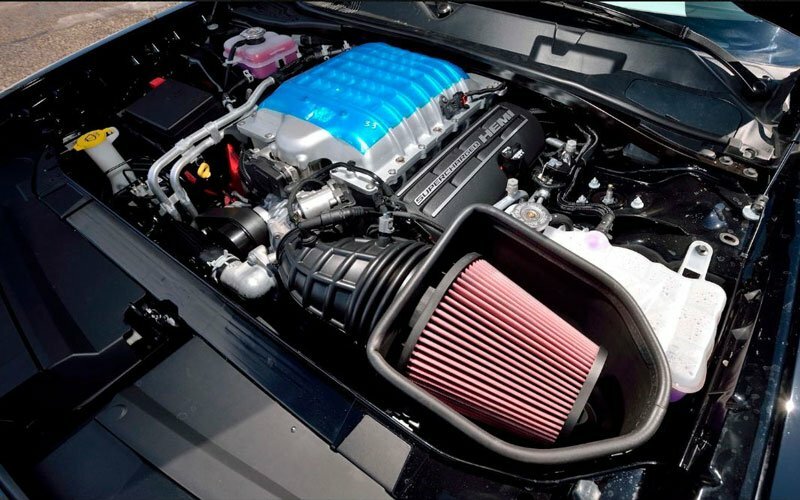 Under that hood is the supercharged and intercooled 6.2L Hemi V-8 engine with aluminum heads and port fuel injection. A ZF 8-speed automatic with transbrake is behind it, and a 3.09 mechanical limited-slip differential can put this monster way into the triple-digit zone. Suspension parts like Bilstein shocks, hollow anti-roll bars, multi-link rear suspension, speed-sensing power steering and 4-wheel disc brakes. 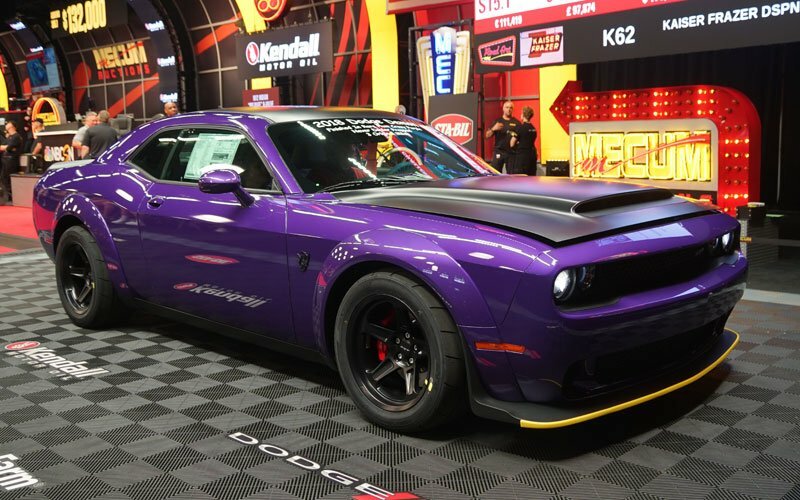 The 2018 Dodge Challenger SRT Demon, street legal but designed for use on the drag strip, is the quickest production car ever built. 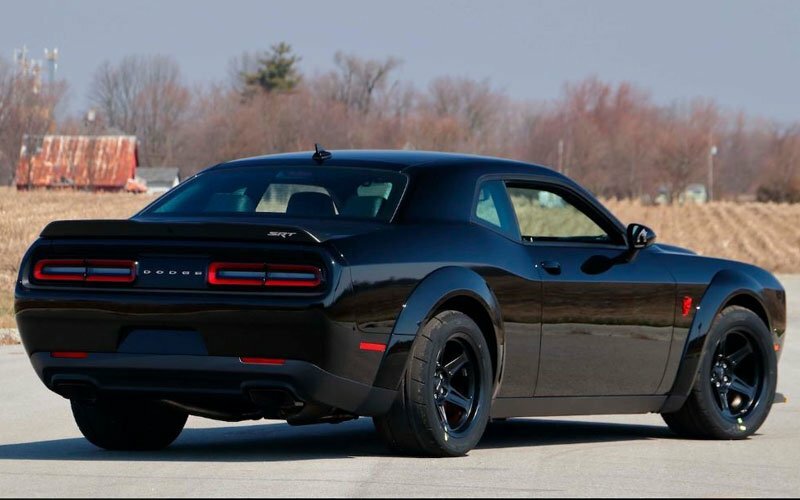 With a 6.2-liter V-8 engine that produces 840 horsepower, the car can accelerate from 0–140 mph in about nine seconds. Only 3,000 are being built for the U.S. market and an additional 300 for Canada. Most hot new performance cars are “under produced” so as to keep the demand high. If it is rare, people will be clamoring for it. But this 2018 Dodge SRT Demon may prove collectible right out of the chute. Will it depreciate in value like all other new cars do after so many years? Or will it be like the Ford GT where it continues to get more valuable every year? We think the latter.